Lalitpur, the 'City of Beauty' was founded in the 2nd century by the Kirats and it remained a valley kingdom until the late 15th century when it became a sovereign state, together with Kathmandu and Bhaktapur. All three were built around Durbar Squares containing Palace and Temple complexes. 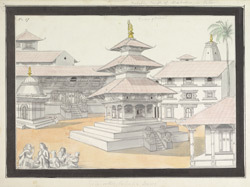 The Mahadeo Temple is dedicated to Shiva and this drawing is part of the Sir Henry Montgomery Lawrence Collection (1806-1857), who held the post of the Resident of Nepal from 1843 to 1846.